Wakita - BO member, closest subordinate of the Boss that underestimates Rum and that drugged Mary. Tsutomu - Former CIA agent. Mary - Former MI6 agent. Asaka - Not Rum. Asaka is Kohji's sister. She was drugged by Rum but survived. It's Maria Higashio. Person who uploads info about Kouji's murder case - ...is Mary & Sera. Muga - Highly skilled investigator/infiltrator/Assassin. He's not full-Japanese. Rum - Iori Muga (Karasuma Muga). Last edited by MeiTanteixX on January 22nd, 2018, 7:18 am, edited 25 times in total. Tantei San wrote: All right my turn..! And did both Rum and the real Hyoue both end up in a coma, 10 years ago? Did Rum lose his memory of Shiho's/Sherry's appearance? MeiTanteixX wrote: Kuroda - Knows about Kouji's dying message, and a switch took place during his coma. Not enough info to tell at the moment. Was only stating the things I was sure of, or at least had a lead towards. True. Is Tsutomu is one of your candidates? Her first name is Sakurako, and her last name is Yonehara. She's one person. Kuroda - I genuinely think that he is a police officer who was in a coma and only has a back story to make him more suspicious. I still like my original idea from way back that he is somehow blood related to Sakurako and that she gave him a bit of info about how Conan acts when other grown ups aren't around, that contributed to Kuroda's other information about Conan, from the NPA, that lead to his conclusion about Conan being the brains behind Sleeping Kogoro. To me, it feels like the two of them, combined with Kuroda, are making this mini "The Secret Behind Sleeping Kogoro" arc within the greater Rum arc. However I doubt any of the three of them are actually Rum. 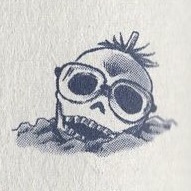 Tsutomu - please be just as dead as Tequilla. Mary - Mary had a little lamb, whose fleece was white as snow. And everywhere that Mary went, The lamb was sure to go. He followed her to school one day, Which was against the rules, It made the children laugh and play, To see a lamb at school. And so the teacher turned it out, But still it lingered near, He waited patiently about, Till Mary did appear. "Why does the lamb love Mary so?" The eager children cried. "Why, Mary loves the lamb, you know," The teacher did reply.
? ? ? - I'm really hoping that its Akai in a wig trying to observe Amuro, to make the transition to him knowing that he is alive, more smoothly. Doing so on the same type of day that he "died" (Friday the 13th) could be a lead in. You know he's going to discover it eventually. Might as well try to curb that homicidal rage. If nothing else, I want it to be Akai so that parallels could be drawn between Conan + Heiji, and Akai + Amuro team ups using this case. Rum - I don't like most of the suspects that we have listed currently. I'm really hoping that Rum either hasn't been introduced, or was introduced in the Bourbon arc, but is not that obvious of a suspect. 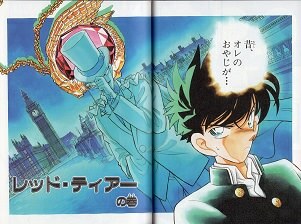 ...I'm still not sure if he's alive, mostly because of Gosho's ambiguous words in the interview. "unfortunately..." sounds like a death, and "It's a secret" sounds like a damage control, in order to leave the survival option a possibility to the readers. And there's too many assumptions to be made before "Kuroda=Tsutomu" makes sense. ...Rum is definitely a valid candidate, but his motives are highly questionable. The most reasonable motive for Rum to undergo a plastic surgery and become a new person would be to infiltrate the NPA, a strong source for vital information(like the NOC list). But then why would he leave it? I'm assuming that Kuroda left it soon after he woke up from the coma. If he wanted to avoid daily connections with original kuroda's colleagues(to avoid suspicion), while still maintaining a bond to the NPA(in order to ask for info when needed, as a superintendent of MPD), then it makes somewhat sense, but that's just a weak reason. Especially when his mission seems to be pointing to exterminating rats, the main focus should be to get as much info on spies from the NPA, and then leave to another prefecture. But considering that Bourbon is still alive, that doesn't seem to be the case,....he just left it...which further points him to being someone else, like Tsutomu(since I'm pretty sure that he is not the original Kuroda). And if Rum is Kuroda, then he isn't using his infiltration effectively, or there is a new factor involved that forced him to step back. jimmy_kud0_tv2 wrote: Kuroda - I genuinely think that he is a police officer who was in a coma and only has a back story to make him more suspicious. I still like my original idea from way back that he is somehow blood related to Sakurako and that she gave him a bit of info about how Conan acts when other grown ups aren't around, that contributed to Kuroda's other information about Conan, from the NPA, that lead to his conclusion about Conan being the brains behind Sleeping Kogoro. At the very least, I think that accident had something to do with Rum, if there's no replacement during coma involved. I can think of what Rumi's relation to the Amanda/Koji double murder... but what would be Kanenori's? Yep—we aren't shown the picture he's looking at, and this happens right after Hyoue was looking at Rumi's picture in the news. Definitely strikes me as a Gosho mislead. Rumi's absolutely not Rum, and both Hyoue and Kanenori have many red herring elements to them. jimmy_kud0_tv2 wrote: Tsutomu - please be just as dead as Tequilla. jimmy_kud0_tv2 wrote: Rum - I don't like most of the suspects that we have listed currently. I'm really hoping that Rum either hasn't been introduced, or was introduced in the Bourbon arc, but is not that obvious of a suspect. And which ones do you like? The way I see it is this—he started by saying, "unfortunately," only to make it sound like he was going to say that Tsutomu was dead, before suddenly saying, "it's a secret! ", thus causing a stir. After all, the text reads: "Unfortunately... it's a secret! ", not: "Unfortunately, it's a secret." Note the differences. True, one must make a lot of assumptions, as we have so little info, at this point. Yes, and that was exactly as I read the text... "Unfortunately...", with "..." dots, implying a continuation to the sentence, but then sudddenly interrupted with "It's a secret". One thing I'm sure of is the swap. Gosho has no reason to hint towards an actual suspicious event and then roughly disregard it as red-herring, since the way the story was told, the nurse was shocked because of a sudden transformation, which doesn't happen right away because of stress. I believe similarly to the bandaged guy from that old Heiji case(File 150), the bandage is changed after every 2-3 days(a pretty short interval), so I doubt the nurse's reaction was out of lack of knowledge. The whole Hair-colour-change in of itself is actually still not scientifically proven to be possible to happen overnight, unless Original Kuroda had gray(black&white) hair from the start and lost all his black hair strands due to alopecia areata(leaving only white hair strands)(Interesting article). Either there was a swap... or Gosho's going to go with that article's explanation and just have Rum be involved in the accident—it's certainly a way Rum could've lost an eye... we still don't know the specifics of said accident. So your other option is that there was no swap? Or am l missing something in regards to the article? 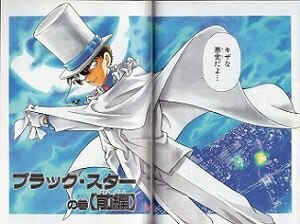 Hope that Gosho chooses the scientific route then. rumi- gf of kohji and asaka. 2. 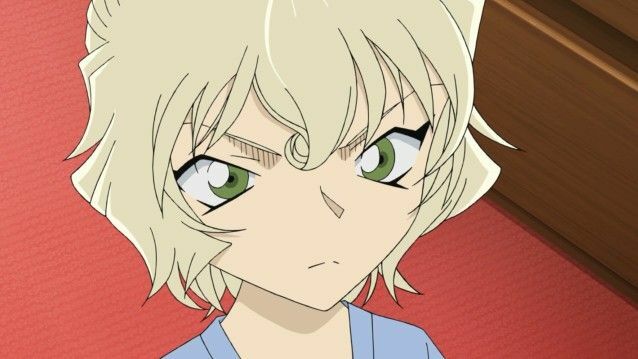 Rum... but only if he doesn't remember what Shiho/Sherry looked like and then the BO basically goes, "Oh, she's dead, no need to inform him about anything related to her! We won't even bring her up!" A. 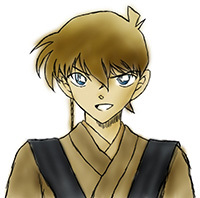 Not Rum – This, I think, is the reason for Gosho making him a Rum suspect; Gosho wants us to think Kanenori is Rum so people won't see the twist coming, the twist that he is a BO member... but he's not Rum. B. Rum – He's more likely to be Rum than, say, Sakurako or Rumi, but I think it's far more likely he'll turn out to be a Rum red herring. 1CA. Shrunk due to APTX? A. NPA, MPD PSB, FBI, CIA, etc. Muga – I have mixed feelings about this (you can thank MeitanteixX for this), but he's higher on the list because of just how low other suspects are. Last edited by DCUniverseAficionado on October 13th, 2017, 3:40 am, edited 22 times in total.